The Care Quality Commission (CQC) has condemned another digital healthcare provider as unsafe, not well led and ineffective. The CQC has found issues with Pharmacy 2U’s patient identification, prescriptions and asthma care. It comes after private online GP service Push Doctor had also been found to be delivering unsafe care in a damning report by the health and social care regulatory authority. Pharmacy 2U operates an online clinic for patients providing consultations, prescriptions and medicines. It claim to be the first and largest online pharmacy in the UK. Pharmacy2U has already taken immediate action to rectify some of the issues after the CQC report was published on 29 June. A spokesperson for the Leeds-based company said in a statement that Pharmacy2U values the CQC’s report and is “implementing the improvements suggested”. The CQC report said that issues with patient identification occurred as “there could be still doubt about the identity of the patient requesting a prescription”. There was also no system in place to minimise the risk of patients under 18 getting medicines covertly, the CQC said. Doctors at the digital pharmacy were also found to be prescribing medicines for “off-label” use. “This meant that patients may not have been clear on how to use the medicines for an unlicensed condition”, read the report. This issue has been now been resolved by the company. Specifically for asthma care, the treatment “was not being delivered in line with current evidence based guidance and standards”, the CQC said. Again, this has now been updated by Pharmacy 2U. The company has previously faced issues when patients were left without essential medication for weeks. In January last year, Digital Health News reported that Pharmacy 2U left patients without their medication as it struggled with technical problems at a new warehouse facility. The company said the issue was caused by transferring its prescription dispensing service to a new automated facility, leading to “unexpected delays for some orders”. Despite this, the internet pharmacy expanded its business last year, with the opening of a new 30,000 square foot warehouse. 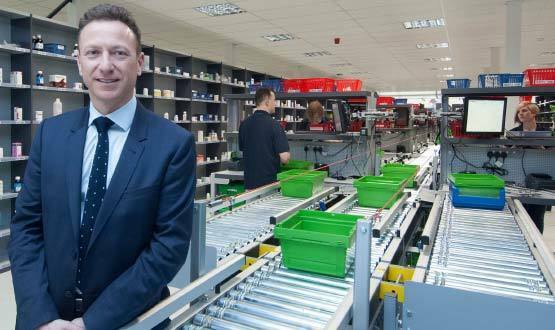 In May 2016 the company unveiled a £3.5 million “state of the art prescription fulfilment facility” in Leeds, that will increase its capacity ten times and enable it to dispatch a million prescription items a month. A spokesperson for the company, reacting to the CQC report, also said that Pharmacy2U has undertaken more than 180,000 consultations without a patient complaint. Since last October the CQC has been providing more scrutiny for digital health services. In April the health and social care regulator cracked down on potentially unsafe online prescribers that fail to carry out adequate identity checks or to review a patient’s medical history, and used its urgent enforcement powers to suspend registrations or impose conditions on four online prescribers. The flurry of digital healthcare providers being found unsafe could also be due to the CQC operating a risk stratified approach to inspections. When all the local Pharmacies are closed because of lack of customers, who will we turn to when we can’t get a Doctors appointment. Please think about what you are doing by ordering from on line. I am shocked by this outdated idea of what you think it is pharmacists and their staff do. You obviously think pharmacists train for 4 years to take a packet of pills off a shelf and put it in a paper bag! Pharmacies have been taking the slack from GPs for a long time. Surgeries now inform their customers that the pharmacy should be their 1st port of call for advice regarding minor injuries and illness. We manage patients repeat prescriptions which drastically decreases the amount of phone calls and patients walking into already strained surgeries. I can assure you that GPs are only human and miss medicine interactions, allergies and non suitable treatments. When all is said and done your GP trains to recognise and treat illness and other health conditions, they know how a medication will affect the body to get a desired effect. Your pharmacist knows about all the different brands of a generic medication. Which will interact with other brands of other medication. How to source these tablets when there are stock issues. They know if it is safe to take with the tablet your consultant gave you yesterday that the GP doesn’t even know about yet. They can give you an emergency supply of your medication when you accidentally run out over the weekend because they know which tablets are going to put you at risk without using them. They can provide a service to check your medications suit you and that you are taking them correctly. They can help you get your medications synced when the GP has changed them loads of times and they are all due at different times. Also, as you obviously aren’t aware, every member of staff in a pharmacy is qualified to a certain degree as appropriate to their jobs. Counter staff have completed a course about over the counter medicines so when you have the flu they are able to reccomend a product that doesn’t interact with your current medication. They are trained to be aware of any large purchases of medicines that are possible to abuse and to watch out for customers that may be buying large amounts of laxatives every week, they are trained to talk to and listen to customers pulling out threads of conversation that may be relevant to their health which can then be passed onto the pharmacist or GP that otherwise wouldn’t have been known. Dispensers are trained to accurately label, dispense and store medicines for the patient and to ensure that the medicines are at their most effectiveness when given to a patient. Then they train to be technicians with a 2 year course of underpinning knowledge and assessments and exams to learn about how the body works and how a certain medication will affect the body. Then they can train to be an accuracy checking technician, checking patients tablets for the pharmacist so they can have the time to provide services that the government want them to provide and actually see their patients instead of being stuck at a desk looking at tablets all day. And when the staff look to the pharmacist for approval it is only because The pharmacists knowledge is far superior to their own and that the pharmacist is responsible for EVERYTHING that happens in the building during the working day. If any member of staff sells something unsuitable or gives the customer the wrong advice which may do more harm then good then regardless of where in the building that pharmacist is they would be held accountable by the governing body, the police and the patient. Pharmacies are only going to keep taking on more responsibility from GPs as the NHS service becomes more and more strained and they will happily do it for the good of their patients. If we don’t shop locally then we will lose all the local shops and only have the choice of huge brand stores … the same will be true for pharmacy. Pharmacies are probably needed most by the elderly and infirm who don’t own or use computers but once they are gone they are gone for everybody. Oh and just a small bit of information …. most GP surgeries (certainly the larger ones) now employ their own pharmacists for their knowledge. Acting as the Devil’s Advocate, may i point out that jobs change. Grocers no longer stand behind their counters weighing out ingredients, slicing meats and cheeses, but sit in their offices pondering stock control while others stack the shelves with pre-packaged goods, ant yet others collect the money at the checkout [until the customers convert en masse to the self-service ones]. True, the deli counters remain, but only a tiny percentage of customers use them. Similarly for pharmacists. Is there any role for the pharmacist in distributing medicines? They no longer have to mix ointments or the ‘mist ut dicte’, nor count pills using the little triangular trays. So it makes sense to use a computerised distribution centre, receiving scrips electronically, and automatically checking off the bar-coded packets against the scrip items. Another role that has change is the Grandmother’s. No longer does she have the knowledge and common sense to deal with most of the common ailments, but is probably out doing a paid job, or volunteering. This role is where the pharmacist could be useful, taking the trivia from hard-pressed GPs over-booked appointment lists, and probably making better use of the pharmacists’ professional knowledge for better job satisfaction. I’ve been using P2U for ages and so much more convenient than multiple contacts with GP and pharmacy, they alert well in advance of next 3 monthly for me. Would be nice if they could check with me the medication was sent and received to close the loop. The role of pharmacist should probably evolve – leave the boring logistics and stock control of repeat prescriptions to large automated warehouses like these (several round the country for backup). One-off medication and over the counter products are still sold in local pharmacies but more focus on advising on diet, nutrition & medications, etc – how that works in practice and how it is paid for is another matter, there is a big market for private health coaches. There seems to be quite a few comments regarding pharmacy2u using the NHS logo. All pharmacies work in conjunction with the NHS as a pharmacy would not be able to survive on private prescriptions alone …. unless you set one up on Harley Street of course. I do not work for pharmacy2u but another pharmacy and my advice if you want to keep your customers is to provide a bespoke service that centres around patient care. We are happy to refer our patients to services at other pharmacies if it is more suited to their needs or we don’t think we can provide them with the best service. I do disagree with the leaflet process for signing up new customers that pharmacy2u have been using as it has been confusing patients …. we deal only with specialist compliance packs so the majority of our patients have problems with their memory, suffering various kinds of mental health problems or other disabilities and yes it has been confusing for them. As I said my particular branch works only with compliance patients and is not customer facing in the way that a customer can just walk into branch. If a customer phones requiring information or assistance and it is in the customers best interest a member of staff will go to see them. We are also always at the end of a telephone line, however, for busy individuals who do not want to be ‘hooked’ for MURS, NMS, WEEKLY/MONTHLY RETAIL OFFERS, BLOOD PRESSURE MONITORING, CHOLESTEROL TESTING, BLOOD GLUCOSE TESTING, PREGNANCY TESTING, WEIGHT LOSS ADVICE or any other service currently on promotion in any one branch before we even mention queueing and waiting times, using multiple pharmacies depending on where you can get to and the fact that a lot of people don’t want to be given different brands every month, I can see what the appeal would be to these customers. Fill in a request online on your lunch break on your phone and have meds delivered a couple of days later.Some people don’t want a personalised service and a chat but for those that do they will soon be walking back through your doors when they realise pharmacy2u is a faceless entity who don’t seem to take responsibility for their mistakes. My quarrel with Pharmacy 2 U’s method of using the NHS logo is not that it is on their leaflets as we all have the same logo stating we provide NHS services somewhere on our own leaflets. It’s the fact it is on the front of their envelope, and so psychologically before the patient has even opened the letter they have assigned the intended meaning of it to be of the uttermost importance, thus resulting in them being duped into signing up for a service they do not require. I agree that a lot of patients don’t require a hands on service but elderly care is a huge part of comunity pharmacy and they are also the most vunerable, which is why we must look after them with the care and compassion we always do. Granted a few weeks or so and their mistake is realised, and they will revert back to their usual Chemist. But the man hours we put into each patient, just for them to be another number in the P2U machine sickens me! If you are in pharmacy just to see £ signs on patients heads you should take a long look at yourself and change career. Yes we have to earn a living but at what cost? Well said ,exactly what happens and the patient has no idea what they have signed ! Knee-jerk reaction by CQC to adverse publicity surrounding online doctors at the end of last year. Previously they had been signing them off for years with no guidance in place. Many walk-in NHS and private services do not require patient ID. Yes, they are covering their behinds. There are many NHS services in much worse shape but they know they will get away with it in the public sector. The private sector is demonised and there will be more of a public outcry. Bombarded with these people by leaflet drops which are very confusing. I like to use my local chemist who know my medication. I think this needs to be followed up. If sent electronically, your GP practice can check the status of the original prescription to see if the pharmacy has claimed for payment for it (which of course, if they haven’t dispensed it for you, the must not have made this claim…. but theoretically could have. My daughter inadvertently signed the ambiguous leaflet that was posted to me so my prescription went to pharmacy 2 u instead of my regular shop- that was about 3 months ago and I still haven’t received the medication. I tried to ring several times but was on hold for over half an hour each time so gave up. Luckily my doctor gave me a new prescription before I ran out so I went back to my regular shop asap. Online Pharmacies remove the patient-pharmacist contact. This may be a more convenient way to order repeat prescriptions but simultaneously can be disempowering. Having read the detailed CQC report , and having visited the fulfilment centre, I believe the improvements required are relatively minor and easily achievable for a business that clearly meets/exceeds most of the inspection requirements. To sensationalise the headline findings is entirely unfair and inappropriate in my opinion. I can only reply as I find Pharmacy 2U,I have been with them for about 2 years and have had no trouble at all ,They send a text to remind me my prescription will soon be due,The delivery is quick.Much better than standing in my local pharmacy only to get served to be told it’s not ready! after given them 2days notice! Jon Hoeksma, editor Digital Health. Great to have a lively conversation underway on the Pharmacy2U CQC report article – but some of the posts have had to be moderated or removed. Please take a moment to re-read the community rules for Digital Health https://www.digitalhealth.net/comment-rules/. A good rule of thumb is that if you wouldn’t say it publically then don’t post it. However, the government want to pay less for ‘distribution of medicines’ and this is what they’ll get- I’d say let them get on with it. Is does seem like a different standard applies. Why do they not have to get signatures for their deliveries? Why the NHS logo on their mailshots? And presumably, the huge amount of money they spend on advertising must be due to confidence in market conditions for them! When I reach a certain age I would like to think I would like the personal service from a friendly delivery driver from my local pharmacy who will know if I’m suffering from illhealth and not able to answer the door and relay that back to the pharmacy to get help . Babylon Health, Boots and Tesco should get their heads together. There has been lots of elderly recently who have signed up to the service as they thought it was from their GP. We should be protecting our local pharmacies as they offer care. maybe it’s the use of the NHS logo on their mailshot!!?? Thank you.. we work hard in the community pharmacy to get to know our patients and understand their needs and deliver their prescriptions on time…we do not want to lose our jobs to an online no face to a name warehouse. As an independent we struggle with the digital world , when a huge organization like this has a problem no prescriptions for 3 months ! We are constantly chasing gps for missing items ordered by the patient , how does pharmacy2u deal with this scenario , multiple deliveries ?? I mean, they dupe patients into signing up with them by making their letters look like they’ve come from gp surgeries, they are incredibly unhelpful at dealing with problems (but then why would they help the people they’re stealing patients from), it takes weeks to get meds from them and lord knows how they even deal with CD prescriptions. Good on them, they’ll make a decent amount of cash by ruining independent pharmacies and probably end up getting multiples or the government backing them up as they undercut everyone else. Heavens….. private contractors using NHS logos under contract. Remind me how do GP’s work? I would be interested to know what members of the public and pharmacy2u customers read trade magazines such as Digital health. And they also know that the name of the GP system is emis. Are we all stupid! It seems that pharmacy2u thinks we are. None in the NHS too. Royal free gifted google millions of records illegally. ICO basically said naughty and not much else. Patients records mixed up and sent for the wrong procedure, ICO/CQC takes no action. There should be a public outcry in ALL cases, with harsh punishments, but people are more interested in demonising the private sector than making care safe for all no matter how it is delivered. Their delivery system is simply not safe IMHO. just posted without the need of a signature. No audit trail and no way of ensuring it actually reaches the patient. Treated like a DVD ! What if postman delivers to the wrong address?? Or a pet chews the post?? And what happens if the medication doesn’t arrive on time. Proper community pharmacy then has to sort out the mess. Much like how the NHS manages care. It pushes bits of paper around and hopes that nothing slips through cracks. There is very little resilience and failsafe’s are few and far between. Case-in-point 100,000’s documents turning up in a warehouse. Controlled drugs through the post? Surely an accident waiting to happen! I work out of hours and have had to deal on numerous occasions with pharmacy 2u customers without medication. Mostly because of no deliveries made, obviously putting patients at risk especially the elderly. God that was a bit obvious – panicked Pharmacy2U staff are contributing to this exposure ! i have used Pharmacy 2U for years now and they have been nothing but brilliant. ! They have courteous staff who provide you a very good customer service and they have never let me down in the 2 years I have been with them. From what I have heard about their CQC visit it went very well and they were most accommodating with them with a view to improving their services even further. A great company who do care about their customers. You sound like you work for Pharmacy 2U….. This is a key point about these private services. The NHS is keen to demonise them, but the difference is they listen and change, responding to consumer demands. That’s why ultimately they will win out over the NHS which is still stuck in the 1950s. Why would anyone use their “NHS” GP who is tied to a fixed location, refuses to email, can’t work a telephone and still resorts to faxing when a modern online service is available for less than your water bill! GP surgeries have been using electronic prescriptions for the last 3 years. As someone who used to work for boots and now the ambulance service I’ve never once had a GP ‘fax’ a prescription since this service came into play. My GP will also send it to whicever pharmacy I choose. ALL FOR FREE! YAY NHS SERVICE! The uptake and availability of digital services is variable at best. Many GP practices are denying patients Patient Online services. There are some better GPs out there I used to have one before I moved, but many places have simply failed to modernise and put barriers in front of change. not sure how useful an online pharmacy is when a patient has run out of medication on a Saturday… or any day come to that? Well I use pharmacy2U for my repeat prescriptions and they are brilliant. I order online via my practice Emis system and often get the items delivered the next day. I think one of Pharmacy2U’s selling points was that you could nominate “any” address for the prescription to be delivered to, not just another chemist or your home. You may well think that this is a great service but it takes place at the expense of the pharmaceutical services provided by pharmacies local to you. Dispensing is a zero sum game which means there is only a fixed amount of revenue for pharmacies from dispensing so if you choose to have your prescriptions dispensed in Leeds and live in Luton then the income goes to Leeds . When your local pharmacies become nonviable if their prescription volume reduces then you wont have pharmacies in your area or some close then there will be regions where monopoly situations take place which does not benefit anyone. Also online services by their very nature cannot make emergency supply when you need medicines, many elderly people forget to order their tablets on time and run out to be helped by the local pharmacy who will tie them over. Also online services are fine for repeats but if you need acute medication then don’t use your local pharmacy still send your scripts to pharmacy 2 u and hope it comes the next day barring transport problems. That i said because they send it by Royal Mail withno need for a signiture.. when we get inspected by GPHC , we have to have show the tracker forms which the patient/representative has signed. Not sure why there are different rules for online pharmacies ??!! The pharmacy i use is actually next door to the doctor, and they can’t be arsed to go and sign for my mother’s scheduled drugs. I can guarantee i will go in they will say they have put up the one drug but haven’t got the scheduled one. I am then between a rock and a hard place because you can’t pick up prescriptions before 10 by which time at work. They will have had a week to go next door. Useless. What is the CQC risk-stratified approach? It’s an absolute disgrace that these reputable companies are being attacked with subjective guidelines that were only released in March 2017 as the basis for the reports. This is all the follow on from CQC being embarrassed by a radio 5 investigation last year. What the real scandal is that companies like medexpress enterprises and Express pharmacy simply use an indpendent prescriber and do not identify patients and have the most simplistic medical form ever. 150000 patients of medexpress enterprises have the same medical patient records as their system is designed for everyone to tick the right answer to get through it. It’s is beyond belief that they are getting away with it as most elderly ED patients are on tons of medication. Their system is designed that if you don’t tick yes or No as they wish you don’t get through. So what do they do before getting inspected, de register from the CQC and get an independent prescriber in. UK meds and asset chemist are using Romanian doctors with the later company having handed back their licence and found this loop hole. Meanwhile reputable companies are getting a hammering whilst the real rogues find the loop holes so they have to follow little clinical protocol. What are the GpHC going to do about it? Digital health take the bull by the horns and find the real story in this and not just regurgitate the CQC press releases as they are making it up as they go along with each report they have new expectations. If you want real scandal I’d advise you to look at the companies that have recently handed their licence back. If you remember it was 43 ish the CQC said they were investigating, now it’s 39. Also if you hand your licence back they don’t even post your reports and take them off the site ! The CQC and the GPHC are well aware of these loop holes but this is not about actually doing anything , this is a it saving face and probing their own right to exist following their embarrassing investigation which showed they hadn’t a clue about what they were regulating. One of patient told us even she did not fill a form of pharmacy 2u and received medication with a letter of telling her exemption card expired . She was very upset about it and worried how they had collected her medical information. She tried to ring them could not reach them even after 10 mins on the telephone. One elderly patient said he signed the form with confusion as he thought his surgery send the letter to him as his surgery name on the form then found his medication delivered left in front of his doorstep. Both of them are back to us, a local pharmacy.